No matter which way you slice it or dice it, running off the bike is tough! Whether you’re an age-grouper or an elite athlete, you’re going to face some challenges when you make the transition from riding to running. As you’ll discover, there are actually some physiological and mental issues that make running after riding difficult. The good news is there are some very practical things you can do to minimise your discomfort, as well as the inevitable drop in efficiency that comes at the start of the run leg. So… let’s get into it! After hard cycling for anywhere between 40-180km, some experts argue that your legs are glycogen-depleted – hence the feeling of heaviness and unresponsiveness. Some also argue that it could be dehydration taking its toll as well. Both of these theories make sense, but they don’t explain why the issue usually sorts itself out after the first couple of kilometres. Another theory is that when you begin the run your nervous system is still in ‘riding mode’. It takes a while for your brain to adjust to a whole new neuromuscular coordination pattern. The fact is, everyone feels ‘un-co’ when they get off the bike and start running! Theory #3 – different movement patterns engage different muscles in different ways, which requires a redistribution of blood from one set of muscles to another. Riding is a simpler activity as far as muscle activation goes – it primarily involves your quads and hamstrings. While these two muscles are obviously heavily used on the run leg, the overall muscular ‘equation’ is much more complicated. Running requires the coordination of a much larger number of muscles – add in your glutes, hip flexors, adductors and core and upper body as well. That’s not surprising. Riding has a two-stage action, whereas running involves a more complex four-stage action. The short version is – it takes a little while for the blood flow to adjust – getting sufficient oxygen to the muscles that need it and dealing with the lactic acid build-up in the now less-active muscles. Practice, practice, practice! Whether you decide to do a ‘brick’ – a full bike session followed by a full run session – or a shorter ‘transition run’ – a full bike session followed by a short run (10-20 mins), in either case you’re conditioning your muscles and your nervous system to cope better with the bike-run transition. Research shows that elite athletes adapt more rapidly that age-group athletes when they run off the bike. My guess is that’s simply because we practice that transition more often and so our bodies get better at adjusting to the change. Whatever your level of ability, practising the transition will make a huge difference. While we’re talking bike legs – the bike leg should be your very own ‘rolling buffet’. One way to minimise the dangers of glycogen depletion and dehydration is to make sure you eat and drink sufficiently on the bike. Have a clear plan and know how many grams and mils you need to consume to set yourself up for the run. Running off the bike can be tough, but the good thing is – it’s tough for everyone. That means that if you can get a handle on the issue and work at minimising its impact using the tips we’ve discussed, you will have a definite edge over your competitors. 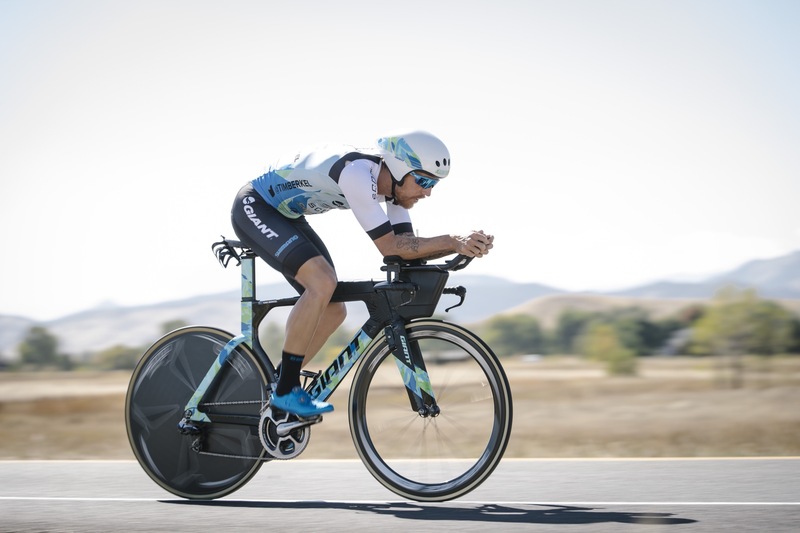 That first couple of kilometres out of T2 can set you up for the rest of the race and time shaved there can have a huge impact on your final result. That’s not a bad tip to finish with – if you can take a difficulty and turn it into an opportunity, then you’re one big step closer to success. And that’s not just true for triathlon, that’s true for life! This was originally written for my great friends at Newton Running.